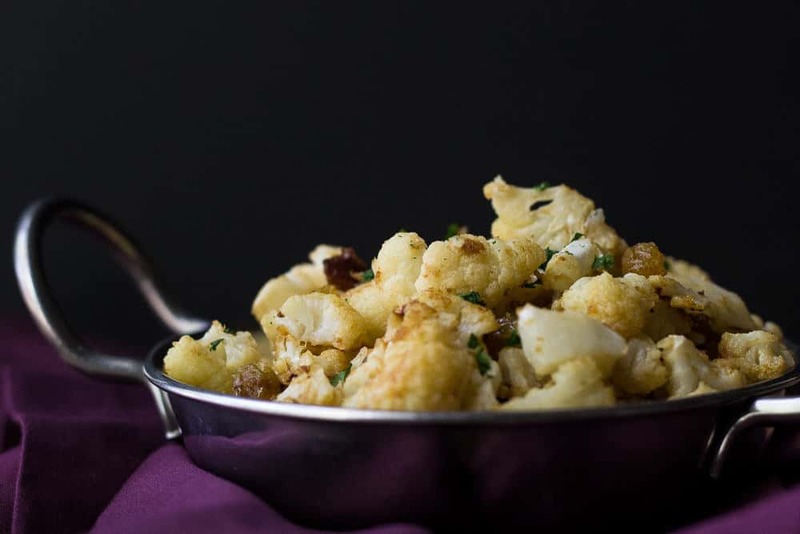 Peanut butter cauliflower is a great way to liven up the simple vegetable. When I wake up in the morning, I tend to grab my phone and check Facebook and Twitter before I roll out of the bed. Usually it’s just workout updates, blog posts, and random trivial bits of celebrity news, like who was seen holding hands with whom. This morning we were not so lucky as we woke to the news that David Bowie had passed. I know this is mainly a food blog, but I couldn’t just have today’s post go up with a random, hey, here’s the recipe, la la la. That’s a bit hard to write when one is weeping into their coffee, right? Like many people my age, I fell in love with David Bowie as a child after I saw him in Labyrinth. I discovered his earlier music later, when I was much older, and his so wonderfully unique way of being. My best friend and I went to one of his concerts when I was 24, and it was a beautiful night. At that point, Bowie was about 58, and he still held the entire audience in a magnetic thrall. Adored. As a creative, one can only hope to be able to continuously adapt to the changing world with the flair and aplomb David Bowie did. He made so many of us more confident in taking risks, in following our passions, in being maybe a little bit crazy in the eyes of others. He made us feel OK with being ourselves. This peanut butter cauliflower recipe is a riff on a brussels sprouts dish from a local restaurant. I knew I couldn’t replicate that perfection, but I wanted to try it with cauliflower, partially for all of you who are getting tired of brussels sprouts dishes (you can admit it). The sauce isn’t incredibly spicy but reminds me of a Thai peanut sauce a bit. I’ve added golden raisins to sweeten things up a little bit. It’s a fairly simple recipe, as I like them, but packs in a lot of flavor. This would be perfect served up with my easy ginger salmon, or even just a roast chicken. This recipe uses an average-size cauliflower, about 2 pounds. Adjust the sauce ingredients up or down if you are using a larger or smaller head. Drizzle 1 tablespoon olive oil on a rimmed baking sheet. Arrange cauliflower on baking sheet, and stir to coat in the olive oil. Roast for 15 minutes. Meanwhile, mix together the sauce. In a small bowl, whisk together peanut butter, sambal oelek, soy sauce, lemon juice, remaining 1 tablespoon olive oil, and brown rice vinegar. Drizzle sauce over cauliflower. Add golden raisins, and stir to evenly coat. Return cauliflower to oven and roast for another 10 minutes, stirring halfway through. Pinned! 🙂 I love cauliflower. I love peanut butter.